Porsche has broken the outright lap record of the Spa-Francorchamps circuit in Belgium, with a heavily modified evo-spec 919 Hybrid LMP1. Neel Jani eclipsed Lewis Hamilton's record time set in qualifying ahead of last year's Formula 1 Belgian Grand Prix by over seven tenths of a second. Jani, a WEC champion and Le Mans winner with Porsche, set a 1m41.770s in the 919 Evo, achieving a top speed of 359 km/h [223mph] and an average speed of 245.61 km/h [152.61mph] on the run. The Evo 919, based on the 2017 WEC car, has been heavily revised for this attempt, which forms parts of the car's 2018 #919Tribute farewell tour. 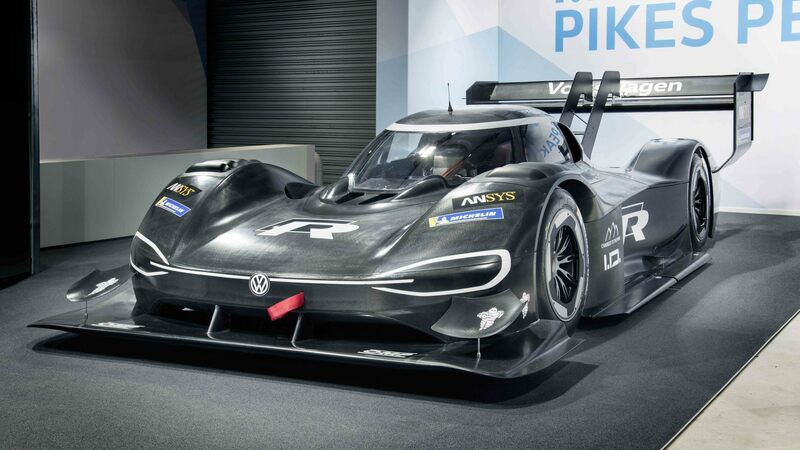 It's powertrain's hardware has been untouched, but without the restrictions of the WEC regulations, and software updates the car produced 720 horsepower (220 more than in WEC competition) with its hybrid-powered V4 twin-turbo engine. Its aero, however, is heavily revised, the car running with a more-aggressive rear, a DRS system, and a new, more slippery front-end, without headlights. "This was an absolute fantastic lap – an outstanding drivers' performance from Neel and the result of great engineering," Fritz Enzinger, Porsche's Vice President of LMP1 said. "Today's track record impressively proves the ultimate performance of the most innovative race car of its time. Our target was to show what the Porsche 919 Hybrid is able to do when we loosen the restrictions that normally come from the regulations." Jani says the 919 Evo is the fastest car he's ever driven; the Swiss toured the circuit 12 seconds faster than the quickest LMP1 lap around Spa in the WEC, achieved last year in qualifying before the 6 Hours. "The 919 Evo is brutally impressive," he said. 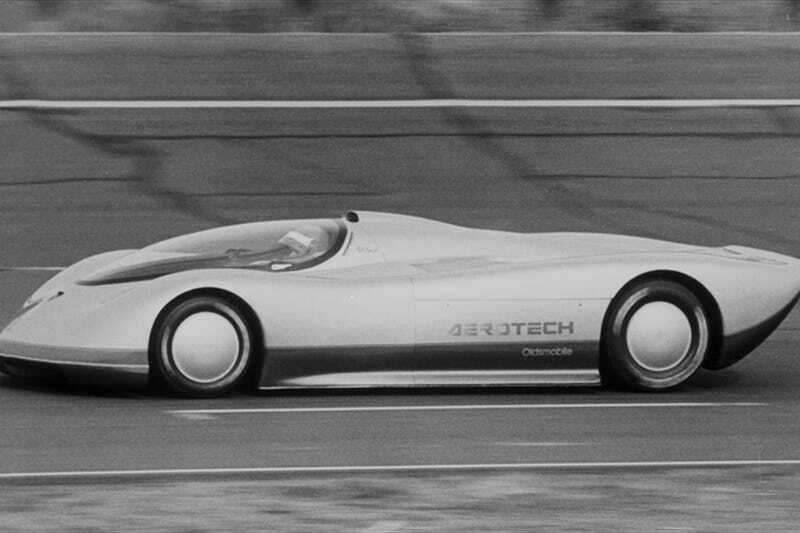 "It is definitely the fastest car I ever drove. The grip level is at a fully new dimension for me, I couldn't imagine this amount beforehand. The speed on which everything happens on a single lap with the 919 Evo is that fast that the demand on reaction speed is very different to what I was used to in the WEC. "We are not only faster than the F1 pole from 2017. Today's lap was 12 seconds faster compared to our WEC pole position from last year! We have had three very intense days at Spa. Today I knew on the very first lap in the morning that the car's performance was super. The race engineers did a great job setting up the car and the Michelin tires are sensational. A big thank you to Porsche for this experience." The project's chief race engineer, Stephen Mitas, said it was especially rewarding to upgrade the 919 (with some of the pre-planned developments for 2018, before Porsche pulled the plug on its LMP1 program) and show off its true potential. "It was kind of an engineer's dream come true for us," the Australian said. "Having developed, improved and raced the car for four years, the guys had a very close relationship to it. We all knew, no matter how successful the 919 Hybrid was, it could never show its full abilities. Actually, even the Evo version doesn't fully exploit the technical potential. This time we were not limited by regulations but resources. "It is a very satisfying feeling that what we've done to the car was enough to crack the Formula 1 record." The 919 Evo will also complete a demo lap on the legendary Nordschleife before the start of the Nurburgring 24 Hours, before appearing at the Goodwood Festival of Speed, the Festival of Porsche at Brands Hatch and Porsche Rennsport Reunion at WeatherTech Raceway Laguna Seca in September. F1 više nije najbrža na zatvorenim stazama (makar na Spa), no kada bi recimo SF71H uradio slično bilo bi 1:42 ili tako nešto. Masivni respekt za Porše i ono što su uradili! Zbog povećeg kaosa u mom priovatnom životu nisam pisao niti otvorio VN Kine. Upravo sam počeo skupljati materijal i ostale đinđulije. Iako se meni strašno sviđa novu font, radi vas učiniću kompromis. Samo službeni logo i mapa staze imaće F1 font, ostatak teme biti će "normalan". Indikar sasija sa specijalnom za ovu priliku dizajniranom zatvorenom aerodinamickom sasijom i Oldsmobilovim motorom, tzv. Olds Aerotek sa kojim je Fojt na Fajerstonovoj test stazi u Fort Stoktonu u Teksasu obisao krug dugacak 12.4 km prosecnom brzinom od 413.8 km/h. Mada ni ovo a ni Porseov rekord na Spa nemaju ni najmanje implikacije na ono sta radi F1, jer F1 mora da igra po pravilima a ove specijalke za obaranje rekorda ne moraju. Svaka cast - doduse, ovo su za sada sve samo nezvanicni testovi, hajpuje se kao da mala vec aktivno vozi trke, ali ipak je retkost da neko u tim godinama sedne u bilo sta jace od kartinga. Njegov stariji brat Kejden je sa 16 postao najmladji sampion na Naskarovoj lestvici (osvojio je kanadski nacionalni Naskar sampionat), otac Dzef, deda Dzo i stricevi Dzo junior i Dzim su se svi aktivno bavili trkanjem na sprintkar sceni i u kanadskom Naskaru. Otišao je još jedan od mojih heroja..
Edited by alpiner, 14 April 2018 - 21:01. Ex-Formula 1 racer Rubens Barrichello has revealed he feels lucky to be alive after his recent health scare and the discovery of a tumour on his neck. The 11-time grand prix winner was rushed to hospital in February after suffering a severe headache at home. He was released a few days later but subsequently had surgery to remove a benign tumour between races in the Brazilian stock car series in which he now competes. Speaking in a television interview on Brazilian programme 'Conversa com Bial', Barrichello showed off a large scar on the left side of his neck where doctors had operated. "After everything that happened, I had a bunch of check-ups to find out more about my health condition and they found a small tumour on my neck, which they removed after a race I did in Interlagos," he said. "I had it removed because, even though it was a benign tumour, it would've grown and I don't want to have that kind of discomfort in the car." The 45-year-old said doctors had told him he was incredibly lucky not to suffer any long-term ill effects - or worse - from his earlier visit to hospital. "A friend of ours who's a doctor saw that I was in bad shape and I'm very lucky," explained Barrichello. "The vein that opened due to a bad formation, regenerated itself with its own blood in two hours. "When I arrived at the hospital, they put in a cannula and saw the vein had closed itself. When I left the hospital, they told me only 14% of people get out of this situation like I did. Many endure serious after-affects or die." Talking about the incident that took him to hospital in the first place, Barrichello said: "I was at home having a shower and suddenly I felt a pain in my head. "From zero to 10 - I'd say it was an eight or nine headache, so strong! I lay on the floor, I didn't want to wake anybody up. But it was hurting so badly. "I walked back into my bedroom and woke up [wife] Silvana. I started feeling sick and realised this was a hospital situation." 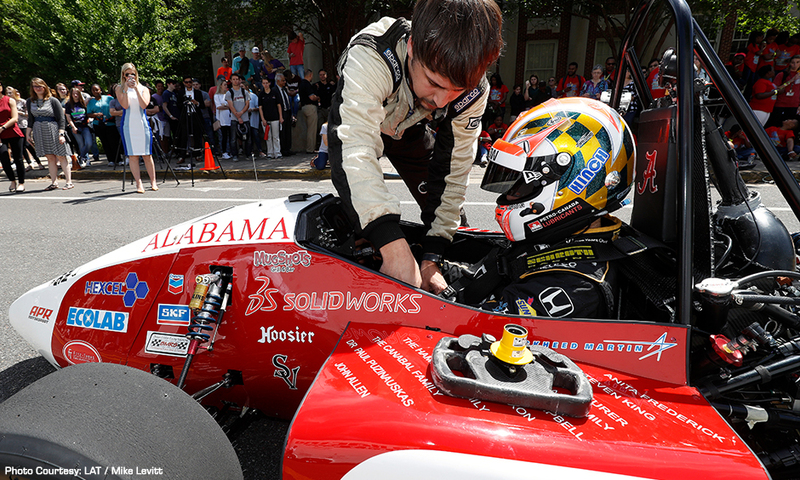 TUSCALOOSA, Alabama – James Hinchcliffe eased off the clutch, spun the rear tires and took the green flag for a short-lived trial run of the University of Alabama College of Engineering’s Formula SAE race car. The Verizon IndyCar Series driver’s quick lap helped team members unveil the race car in front of more than 300 area middle school and high school students – and college students transitioning between classes – during the Honda STEAM Connections Tour event at the college campus on Wednesday. The Honda STEAM Connections Tour showcases the science, technology, engineering, the arts and math (STEAM) that are the underpinnings of motorsports and the automotive industry. Students toured the College of Engineering’s 3D printing, astrorobotics and mechanical engineering and civil engineering labs in addition to outdoor interactive displays featuring a competition electric vehicle (EV) car from Huntsville, Alabama-based GreenpowerUSA, a Honda Performance Development (HPD) mobile engineering unit, and the Honda Manufacturing of Alabama MDX that competes in the Pirelli World Challenge. Hinchcliffe, who drives the No. 5 Arrow Electronics Honda for Schmidt Peterson Motorsports entry in the Verizon IndyCar Series, and his HPD engineer, Brian Johnston, also fielded questions from students during a formal program in the Ferguson Student Center. 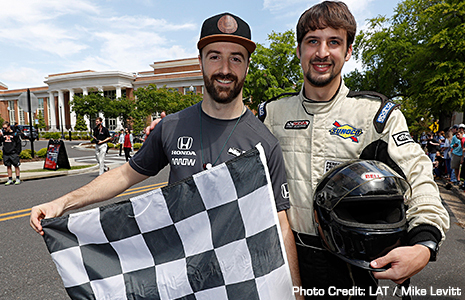 “These students can do anything they put their minds to,” said Hinchcliffe, who has recorded five victories in the Verizon IndyCar Series heading into this weekend’s Honda Indy Grand Prix of Alabama at Barber Motorsports Park in Birmingham. 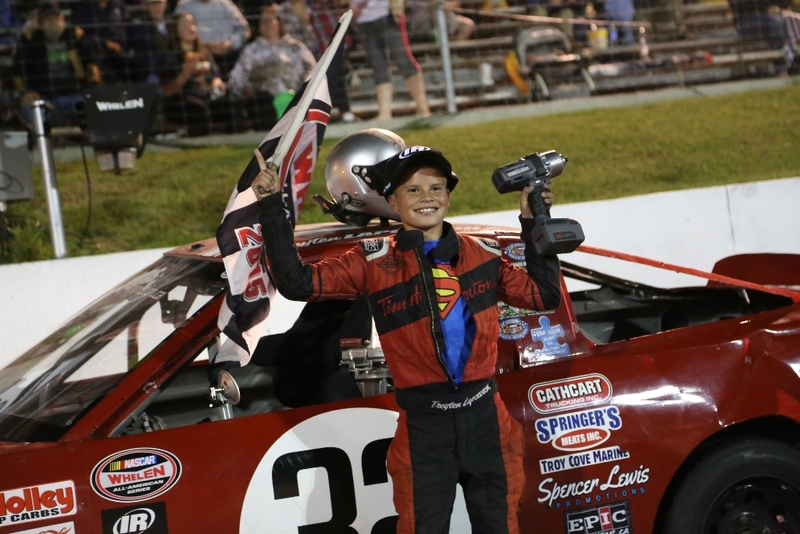 “I was a kid from Ontario who just wanted to drive race cars for a living. There were a lot of obstacles, a lot of challenges along the way, but I put my mind to it. I didn’t have a Plan B because that would distract from my Plan A, so I focused all my energy into it and here I am now. “For me, that’s the message behind this all. What we’re trying to show here is that the sciences and the math have a broader reach than the students might think. They have a lot of real-world applications and those are continually growing. Literally every element of STEAM is on display with my race car. As a driver, you pretty much have to have a minor in mechanical engineering to understand what your race car is doing. If you don’t understand what it is doing, you’re never going to be successful. Abigail Stevenson, an eighth-grader from Tuscaloosa, affirmed Hinchcliffe’s objectives. She also was the recipient of a couple of twirls with the 2016 “Dancing with the Stars” runner-up to a round of applause from schoolmates. More than 40 engineering students have devoted 12,000 man-hours into building the carbon-fiber Formula SAE car with a motorcycle engine that will enter competition in May. The University of Alabama stop was the first on the 2018 Honda STEAM Connections Tour. It is the third year for the program that visits universities in the proximity of several Verizon IndyCar Series races. "James Hinchcliffe and HPD's own Brian Johnston did a wonderful job of engaging the students, several of whom surprised me with their extraordinarily perceptive questions,” said T.E. McHale, manager of motorsports communications for American Honda. "That said, I would not be at all surprised if, six or eight years from now, I bump into a member of today's student audience working at a racetrack somewhere. It was a terrific day, and I look forward to several more as our program continues through the racing season." The next event is May 15-16 in conjunction with Purdue University at Indianapolis Motor Speedway. Napravio sam mod za F1c s Porše 919 tribute prototipom. To je zver svih zverova, orgazmi praćeni orgazom kroz svaku krivinu. 1:44.0 u Spa, 1:08 u Interlagosu te 1:13 u Monaku.